The College Board awards the following distinctions for AP exams, and we have students who have achieved all levels. 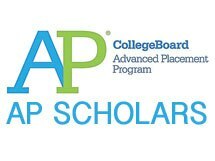 National AP Scholar: students who received a score of 4 or higher on at least 8 exams, and an average score of 4 or higher across all exams taken. AP Scholar with Distinction: students who received a score of 3 or higher on at least 5 exams, and an average score of 3.5 across all exams taken. AP Scholar with Honors: students who received a score of 3 or higher on 4 or more exams, and have an average score of at least 3.25 across all exams taken. AP Scholar: students who received a score of 3 or higher on 3 or more AP exams. 42 of our high school students were awarded AP Scholar distinctions, representing 60% of our growing high school. The National AP Scholar award is typically the highest honor granted to a student before graduation and is granted to less than 1% of students nationwide. Four BASIS Independent Brooklyn students received this honor. In 2017, only three freshman in NY received the AP Scholar with Honors award. In 2018, ten freshmen from BASIS Independent Brooklyn earned this honor: Elizabeth C. ’21, Elisa C. ’21, Ethan H. '21, Nicholas L. '21, Chiara P. '21, Oliver R. '21, Matthew S. '21, Joshua S. '21, Lezhi T. '21, and Asha W. '21. Fewer students across the U.S. receive the AP Scholar with Honors award as freshman than there are perfect SAT scores in the country every year. To achieve any AP Scholar award by the end of grade 9 is a rare feat. Nationwide, about 1,200 students, or 0.03% of grade 9 students across the country achieve this honor. More than 35% of BASIS Independent Brooklyn's Class of 2021 received an AP Scholar award. “I’m proud of all the hard work our students put in throughout the year, and that they are continuing in the BASIS Curriculum tradition of demonstrating exceptional performance on college-level coursework. We realized as we begin 2019 that we needed to reflect once more on the great work done by our students,” says Head of School Hadley Ruggles. AP Scholar with Honor: Students who received a score of 3 or higher on 4 or more exams, and have an average score of at least 3.25 across all exams taken. Nationwide, only about 6% of students will graduate high school with this degree of recognition or higher. All these honorees have done so well before graduation. AP Scholar with Distinction: Students who have a score of 3 or higher on at least 5 exams, and an average score of 3.5 across all exams taken. These students have already completed at least a semester’s worth of college credit while still in high school. Only about 4% of graduating seniors receive this award, and less than 1/10th of 1% of students receive it after sophomore year. All comparisons are based on publicly available data from the College Board, National Center for Education Statistics, and National Merit Scholarship Corporation.